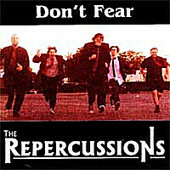 With a love for mod-rock, but not without its rockabilly and punk influences, The Repercussions deliver their debut, Don't Fear a record that makes up for its faults with plenty of enthusiasm and energy. Though, it is hard to escape the demo quality of this recording. The sound needs more emphasis, more muscle behind it to truly carry off what they're going for. That being said, there is still a lo-fi charm to the disc that gives the mod-rock/power-pop/rockabilly offerings a simplistic, straight-ahead approach, making it sound like you're hearing the band live, in their basement, as they practice, which allows you to really get to know the band. And that can't be all bad. I'll give it a C-.